Curiosity photo: Light seen on Mars is a camera artifact, not a real one. Did Mars Curiosity See an Alien Light on Mars? Duh. No. An alien beacon? A transdimensional portal to an alternate Universe? Or just a blip in a photo? You decide (but it's the last one). Click to enaresenate. Apparently April is the month to debunk astronomical foolishness, for I have yet another bit of space silliness to disassemble. Yesterday, the Houston Chronicle ran a story showing a picture from the Mars Curiosity rover, which has been exploring the fourth rock from the Sun since August 2012. As the rover moves over the Martian surface it deploys an arsenal of tools to examine its environment. That, of course, includes cameras. Many of the pictures are visually stunning, and some are plain old weird. After all, they’re shots of the landscape on an alien world! Yes, you read that right. The Houston Chronicle is repeating a story they found on a UFO conspiracy site. When I saw the picture, I knew right away it wasn’t from some artificial source. It wasn’t even really a light source on Mars! I’ve worked with astronomical cameras for many, many years, and we see little blips like this all the time. To make sure though, I asked my friend Emily Lakdawalla, who is also a planetary scientist and journalist. Her immediate response: cosmic ray. Ah, of course. Cosmic rays are charged subatomic particles (like protons, electrons, and so on) zipping around in space. On Earth, our atmosphere absorbs them so they don’t have much of an effect on cameras down here. But if you put a telescope in space, they are bombarded by these little beasties. When a cosmic ray slams into the electronic detector in the camera, it deposits some energy in the pixel (or pixels) where it hits. These detectors are designed to detect energy from incoming light, and they can’t tell the difference between a cosmic ray hit and a photon coming from a distant star. All they do is register the energy (you can read a lot more about this on a page where I dismantled claims about Planet X). And that’s what we have here. Curiosity was taking a picture of the Martian horizon, and during the time the picture was taken, a subatomic particle smacked into the camera, leaving behind its trail of energy. It’s a camera artifact, not a real one. See? It’s in one camera’s picture but not the other, even though they were taken at the same time (on April 3, 2014, at 10:00:03 UTC). As you can see, the landscape shifts a bit due to the different perspectives of the two cameras. The light is in one shot, but not the other. 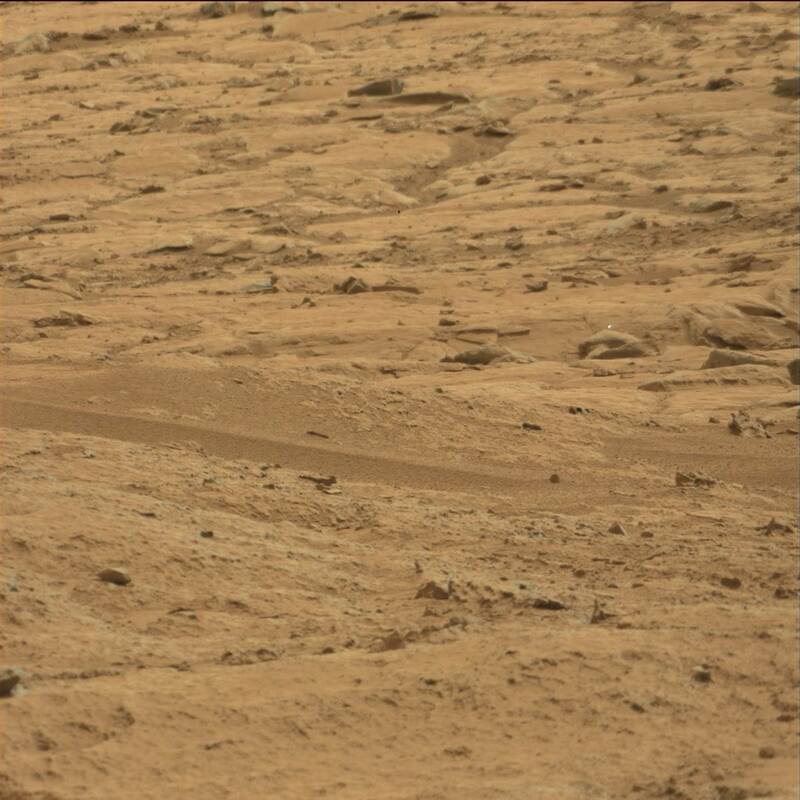 I’ll note we see this kind of thing all the time, including in Curiosity images. Here’s one over a rock, for example. It’s not hard to find more if you peruse the Curiosity raw images archive (or the Unmanned Spaceflight forum, where space aficionados post and discuss the latest images from various missions). So that’s what we have here. It’s not some alien rave, or a stranded bug-eyed monster signaling for help, or other fanciful fiction. No, it’s far more mundane, merely the quantized energy deposited by a subatomic particle that was accelerated in the magnetic fields of an exploded star and traveled thousands of light years across the galaxy at nearly the speed of light to finally slam into an electronic camera mounted on a mobile nuclear-powered laser-eyed chemical laboratory humans sent to another planet. Clearly, reality’s not cool enough. We need to add aliens to make this a story. *Correction, April 8, 2014: This post originally misstated the name of the website UFO Sightings Daily.